I was pretty sick last week. No life-threatening sickness, just a common, but hard cold, the ones you get almost every year at beginning of flu season. It’s fine, you feel miserable for a few days and then go on with business as usual being essentially cured for the winter. But those few days truly are horrible. In that sense you can’t do anything which requires lots of thought. The dumber the TV program, the better. There was no way I would be reading any of my usual science or geekery stuff, even a simple newsmagazine turned out to be much too difficult. However, I did not want to subject myself to the torture that is daytime german TV, either. So I opted to start to marathon a series that has been on my list forever, but which I wanted to leave for a vacation or one of these sick periods (it was only last year, exactly when sick, too, that I discovered “Breaking Bad”). It was “Friday Night Lights“, a series about a high school football coach in Texas. While the football is an important part of the story, it is more about the interplay and the hardships in a small american town. It is sometimes a bit soapy (“will they or won’t they get together?”), preachy (“everybody deserves a second chance”) and boy does it try to get the tears out of you. But overall a fine series, of which I finished the first 2 seasons during those sick days. What got me the most is how these high school kids were under so much pressure and all that before they got to college. Even getting to college was a hard thing, but kids already have lived through a lot by the time they are sitting in my “Intro to Astronomy” class. They were carrying around a lot of baggage. It dawned on me how great it is that the kids (and yep, I feel like more of a mom now) that are sitting in my class actually chose to take a course that might be considered hard. I had to compete with a lot of personal factors to get them to sit in that lecture. And not only that, a lot of them actually like it. In the October I held a lecture, the first real one of the semester dealing with Kepler’s laws and stuff like that. The homework was something really simple, they just had to go through the last few APODs (Astronomy Picture of the day) and send us the one they liked most and why. Fortunately, the day of the lecture was video of the Space Shuttle going through the streets of LA. I had chosen before the lecture to just let it play in the background while the people were filing in and I was preparing my notes. Suddenly, the people were pointing at the screen, whispering to each other and looking fascinated. I choose to take a short detour on my lecture and we talked about the Shuttle and the Space Program for 15 minutes. A lot of the students were very knowledgeable and it was more of a conversation. I could see the sparkle in their eyes, that they loved to talk about it. Good times! We carry a lot of baggage, we all have stuff going on at home, so I am always thankful when somebody shares my interests and is willing to spend time on it with me. I hope most of those students find that interest, it doesn’t have to be Astronomy, but I hope there is something that incites passion in them, that let’s them not succumb to bad stuff at home that might be drawing them down. I realize the title of this post might be prone to misinterpretation, but it’s at the heart of the stigma that I’m about to describe. It’s a purely personal post this time and I’m putting myself out there, but it’s stuff that I’ve seen relating to traditional gender stereotypes. As such, I might have exaggerated something in my mind and generalizations are meant as such – they don’t pertain to everybody! It was my birthday last week. I was very happy for all the congratulations from all around the world given to me. In the evening we went out for an amazing gourmet dinner with my husband and daughter. It was in a restaurant called “Hexenhaus” (witches’ house) and since it was around Halloween the decoration was very according to theme. Anyway, I am not a foodie in the strictest sense of the word, but I do love good food and that it was, yum! But the funnest part was spent the night before, celebrating INTO my birthday – playing poker! And since I don’t know that many girls/women that play poker as passionately as I do, it meant playing poker with the boys. What was touching, was that promptly at midnight, the boys stood up and sang their “Happy birthdays”, brought out cake and gave me big hugs. I had not told them it was my birthday, they looked it up on their own. awww. The next few days I got all into this introspective mood, how I am still “playing with boys”. All my life I’ve done that, I’ve enjoyed it much more. It has influenced me to the point that I choose to make those interests that were traditionally pursued by “boys” my own. I am not entirely sure if it was if I enjoyed playing with the boys more of it were more traditional male activities that I liked, but I’ve often found myself in situations where I suddenly had to stop, look around and see I was the only female around. I don’t notice this as often, because you are so immersed in those activities when you are having fun. When I was a child it meant going go-karting with my dad amongst a trough of boys doing the same thing with their respective dads. It meant playing soccer with my male classmates. As a young teenager it meant organizing Super Nintendo outings with other boys where we would order pizza and just trash talk to each other. It meant playing basketball with the younger boys in my neighborhood. As a teenager it meant long afternoons at the comic book store playing Magic: The Gathering. And here I am, grown woman with a family, still playing with the boys. Don’t get me wrong, it’s not that I don’t like activities that are mostly populated by women – I love chick flicks and girly books, for example. Some of my best friends are female 😛 – nah, they all are. It’s just that again and again, when I’m doing something socially, with people around, I find boys around me. It’s almost as if it is easier for me to communicate to you via games – especially card and strategy games. You know what has been great? All throughout the years all of the boys have taken me in. I don’t recall an instance where I was told I wasn’t welcome because I was a girl. Sure, there was some trash talk along the way, when I excelled (“you got beaten by a girl”), but I don’t recall anybody ever turning me away. You know what hasn’t been great? The reaction from outside! “Why do you want to try out for karate? A girl doesn’t fight!”, “I’m having trouble accepting the fact that you are not hanging out with girls of your age (14-15) and are spending your afternoons with 10-11 year old boys”. There is a whole lot more skepsis from outside, mostly born out of ignorance, sometimes out of cultural biases. Or maybe they think men and women can never be friends. Or what do I know, it’s from the outside, not the people dealing with the substance, but the people just looking in. And here is where the astrophysics relation comes in. Over the course of my time studying and working in physics it has been quite similar. Never once did any fellow student or colleague think any less of me because of my gender. And yep, there are mostly boys around me at work, too (though maybe not that pronounced as I have witnessed with other interests in my life). But from outside: “Why do you feel the need to lie to strangers by telling them you are getting your degree in astrophysics?” (yes, this really happened). More examples came when I became a mother, but I’m not sure if that had anything to do with the profession or the fact that I was going to work at all, so they probably don’t apply here. I guess readers will counter all the numerous studies about how women thrive in STEM fields exactly *when* they are separated and amongst themselves. Since they do, there must be some inherent discrimination in the group itself, otherwise the good ones will always succeed. Well, I have no counter for that, I just want to say that either a) I’m very blind/deaf to that discrimination or b) I did not experience it. Ah, this now sounds all wrong. My main point is that I just want people to thrive at what they have fun and don’t just do something, because it is social convention to do it! If it means crochet, then you should pursue that, no matter what the others say. May the people outside think what they want, the people in the crochet club will welcome you with open arms, I’m sure! For a long time programming has been a “means to an end” kind of thing. Like math, I was never really interested in full derivation of the proofs of the theorems we were doing in class. I just did the math and I was damn good at it, if I might say so, but I don’t think I would be happy being a pure mathematician. Similarly, I enjoyed my programming classes in college very much. It was sort of a game for me who would write the best (efficient, working) programs with the least amount of lines. I always enjoyed that challenge. As such, when it finally came to research, I’m happy to say that I did have the tools to tackle the daily tasks in programming presented to me. I had the techniques of algorithmic approach in me to take on large databases, for example. It was only a few years later that I started to realize that my programs were pretty bad. Oh, they worked perfectly and fast, but no person but me could actually use them (and maybe not even me 5 years from now). They were horribly documented, were unreadable and required the input data to be in an extremely narrow way specified by me. I realized this when I started to publish and people were starting to e-mail me asking me how I calculated the Gini coefficient or Balnicities or similar. It dawned on me that I would be a lousy programmer at a software company or for everything that involved large collaborations. This was very present in my mind when I came to Germany to work on the Data Reduction Pipeline for MUSE. I was (and sometimes still are) scared that people were going to dismiss my work, since it was documented so lousily. I’m actually quite happy that I have been tasked with the documentation of the pipeline, because that is allowing me to approach this very rigorously keeping in mind that everybody in our collaboration should be able to use the software. In german, we have the acronym DAU – “Dümmster anzunehmender user” (dumbest possible user) as a wordplay on GAU – “Größter anzunehmender Unfall” (greatest possible accident) from nuclear power stations. It relates to program “usability” in general. I was then quite excited when recently a paper was published on “Best Practices for Scientific Computing” by Aruliah et al. 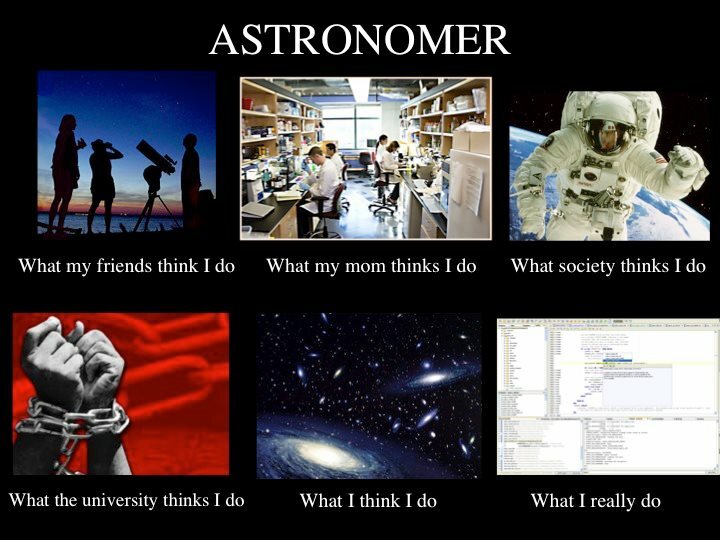 It exactly describes the problems that are facing us astronomers more and more. In a world were author lists are growing, survey data often out-trumps single observations and ever larger and more complex observing instruments, we are increasingly faced with programming – and not easy peasy programming at that. A lot of my fellow colleagues think that ever astronomer nowadays should take at least one year sabbatical to *really* get into the world of computer programming, not just your quick shell script to modify your ascii table, but really rigorous scientific approach to it. I don’t quite share that extreme of a view, but if you check out the “whatmyfriendsthinkido” meme for astronomy going around at the beginning of the year (see above), it is a quite accurate depiction of my laptop screen most of the time. There are variations of this meme, but the main point remains the same. Anyway, but back to the article. I had sort of an epiphany last week. I was reducing actual MUSE lab data – lamp tests, pinhole mask tests, geometry issues and the like. If you look at the image below, you’ll see that we still have a long way to go… uff. The important thing is that there were on the order of 50 files and there were not ordered particularly well, you had to look in the headers to find the type of observations, to see which BIAS you had to use – very chaotic. Part of me was screaming to just go through them by hand and just run the pipeline on them one by one, since I would have to use different biases, arcs, flats and the likes, plus they were totally named with different identifiers. But I remembered that article that I should not keep on doing repetitive tasks. So I soldiered on and 3 days later and many google (stackoverflow and similar) searches later I had a working program on which I could just hit “Enter” and let it run over the weekend. Now, perhaps running it “by hand” might have taken the same 3 days it took me to write that automation, but I had so much fun doing it. My office mate even learned something new relating to bash. I went home that weekend so satisfied. And I was proud of my little program, ready to tackle the next round of testing! And then I remembered the legend that “DVD Jon” once said (I think it was him that said that, but I’m not entirely sure) that he had way more fun developing DeCSS than later watching the movies derived from that program. In a way, I learned that way of thinking from my father, too. He builds molds for the plastic industry, mostly complicated thermoforming ones. But that challenging work is way more fun than the final product that just gets stamped out by the millions. I don’t know, it was such a well written and easy to read article, just wanted to give out an endorsement of it again and urge you to read it!